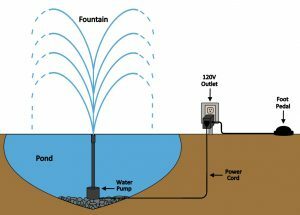 Our main facility’s landscaping includes a small pond with a water fountain.The fountain is controlled by a water pump that connects to an electrical box. Using the PBA-01 air switch converter box with a foot pedal attached, we are able to operate the outdoor water pump, turning it on and off, with the step of a foot. 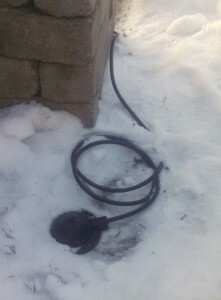 The foot pedal survives harsh environments, as it was installed October 2014 and is still operating after the cold Wisconsin winter with temperatures as low as -10°F and 14 inches of snow. The PBA-01 converts electrical equipment to a device controlled by a shockproof/waterproof foot pedal by plugging the equipment to a receptacle box which contains an alternate action air switch, turning the plug into a standard electrical receptacle. And because Presair’s air switching system deliver complete electrical isolation with zero voltage at the point of actuation, the foot pedal is safe for operation in any environment and can be easily disguised. You can purchase the foot pedal in our on-line store. We added a link for easy navigation to the post at the bottom.